KOLKATA: Pundits had warned of a slowdown in farm credit delivery following debt waivers by state governments and the latest Reserve Bank of India data validated their fear. The states, which announced debt waivers as a mechanism to address farmer distress, saw impacts on farm loan delivery in various degrees, according to the RBI data released on March 3. Maharashtra, which waived farm loans in 2017, saw 5.4% dip in credit delivery in FY2018, while bank credit lost momentum in Uttar Pradesh, the second largest recipient of farm loans. Even as the credit culture took a hit from debt waivers, bank loan offtake in all states together rose 11.2% to Rs 12 lakh crore in FY18 as banks chased targets set by the government, the RBI data showed. Farm distress and lower food inflation led to lower revenue generation for the farmers and the slow bank loan delivery only added to their woes. Uttar Pradesh waived farm loan in 2017, shrinking bank credit growth to agriculture to a mere 1.5% in FY18, compared with 13.5% in the preceding year. Tamil Nadu, the largest recipient of farm loans from banks, had announced waiver in 2016. The state farm loan growth was slower at 6.3% in FY17, compared with a 16.3% jump in the previous year. Assam, Madhya Pradesh and Rajasthan joined the league of loan waivers in December 2018. Andhra Pradesh, Telangana, Punjab, Rajasthan and Karnataka waived loans in different years since 2014. Farm loan to Chhattisgarh farmers dropped 11% in FY18. But it cannot be linked to debt waiver as the state announced the largesse only in December 2018 after Congress came to power. 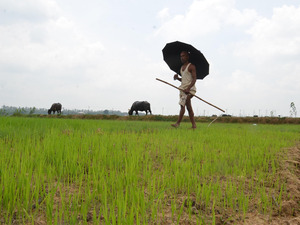 Odisha and West Bengal announced schemes to provide financial assistance to small and marginal farmers along the lines of Telangana’s Rythu Bandhu scheme.